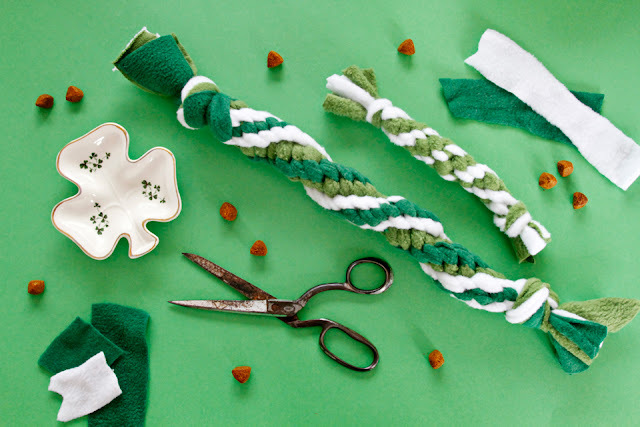 St. Patrick's Day is coming soon, and it's ever so easy to have a little pinch-proof playtime by making your dog a new green toy. Modern St. Patrick's Day celebrations are all about the green (did you know that Saint Patrick's traditional colour is actually blue? ), and you can't go wrong by mixing together fresh bright greens on their own or with a pop of white, glitter of golden yellow, or even a flag inspired orange if it takes you fancy and suits your available materials. 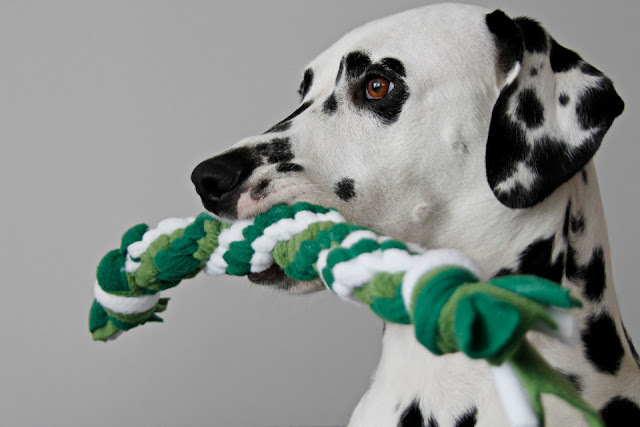 The two-toned green and white double spiral twist tug toy featured in the photos above was made in exactly the same way as our Valentine's double spiral twist tug toy. I though I'd share it again in a fresh green colour combo. You can find the detailed instructions with photos and diagrams here. The smaller pale green and white spiral/circle tug toy was made using my leftovers from the big spiral - all of my fleece was the same end-to-end length, but double spirals require four equal strands and two longer strands, so I made a mini-tug with my extra fleece. You can this style of tug easily using either a twisted box knot (as I did for this toy) or a circle twist. Both methods are very simple and the results for a four-stranded fleece tug are pretty much identical (see side-by-side here), so its really just a matter personal preference. The easiest type of fleece tug to weave (IMHO) is the simple square tug toy created using the basic box knot. It's a great option for beginners or for any level of crafter looking for a cute and quick DIY. Check out the detailed instructions here - it's one of our most popular posts. 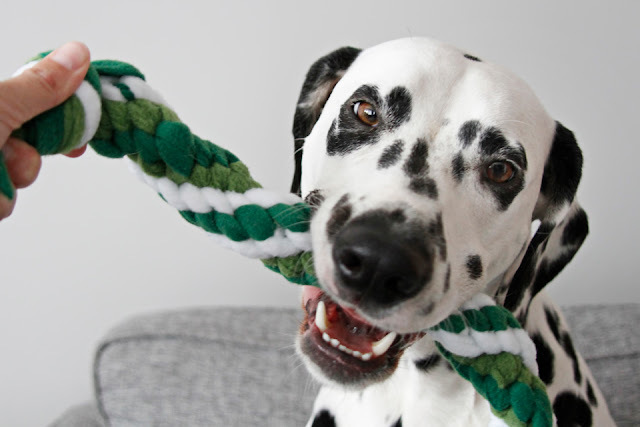 From the basic box knot, it's an easy advancement to try a twist (like the small tug in this post) to create a simple spiral tug toy or add a loop to either style of tug. Check out our instructions for basic loops and loop/handle style tugs. For more ideas like this post, you can dig through our toy archives, explore all of our tug toys or hop into our St. Patrick's Day collection for toys, treats, and more. Have fun!